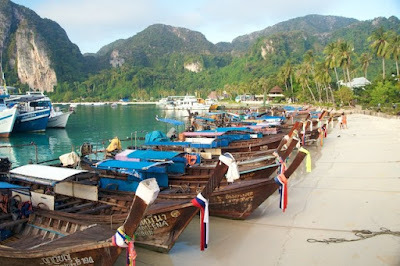 Long tail boats crowd the port on Kho Phi Phi Don in the Andaman Sea, Thailand. During my trip in November-December to Thailand, the tiny island of Kho Phi Phi Don was one of the most magical places that I saw, and when speaking of Thailand that statement should not be taken lightly. I arrived at Kho Phi Phi via the larger island of Phuket. A short flight south from Bangkok put me in Phuket’s small airport, where I met a couple Brazilian guys who shared a cab with me to the port. One of the great pleasures of traveling alone are those moments you share with other travelers you find along the way – in this case we laughed about our escapades in Thailand all the way to the port, where we dumped our bags next to the water and waited for our boat. The 2.5 hour ferry ride from Phuket flowed by in a sleepy haze and when I lugged my backpack onto the dock at Kho Phi Phi the first thing I noticed was the heat and humidity that pressed down on me. In Bangkok it had been pretty warm, and up north in Chiang Mai and Pai the weather had been perfect. Kho Phi Phi wanted to make sure I knew it was a tropical island, even though November was coming to a close. Kho Phi Phi Don is one of two tiny islands floating in the Andaman Sea off the Thai mainland. The other island is called Kho Phi Phi Ley, a tiny and paradisiacal rock that is better known as “The Beach”, where the movie was shot with Leonardo DiCaprio and where the original book was set. One of the biggest reasons travelers seek out Kho Phi Phi is the world-class scuba diving to be done in the waters surrounding the island. One of the things I “had” to do while in Thailand was get my Padi Open Water dive certification (rough job, right?) and so for 4 days I hit the books, watched the videos, and got wet. I came away with my dive logbook and the memories of a lifetime. The best way I can describe the sensation of scuba diving is that you feel like you suddenly have the ability to fly, and you’re flying over an alien planet inhabited by the wildest creatures you’ve ever imagined. I’m not a person who always dreamed of scuba diving, in fact, the idea of it always kind of scared me – why venture into the briny deep when I’m breathing air just fine up here? However, my first dive, at Bida Nok, absolutely blew my mind. Some of the many creatures I saw on that very first dive include giant moray eels, barracuda, a blue-spotted stingray, a leopard shark, many parrotfish, triggerfish, anemones, clownfish, and a varicose wart slug. Yes, a varicose wart slug. My life is now complete. On my next dives I saw 7 hawksbill turtles, 2 black tip reef sharks, sea cucumbers, an amazingly camouflaged cuttlefish, 2 lion fish, a grouper, and countless other colorful species. 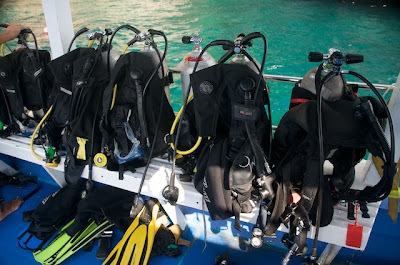 Go diving. You won’t regret it. On my way down from a short hike up the hill to get a view over the island – see above photo – I ran into this little vivacious monkey tethered to a post. He was sitting on a table with a baby Thai boy and wanted nothing more than to play with this kid, who was way more interested in playing with some kind of white fruit that I had never seen before. 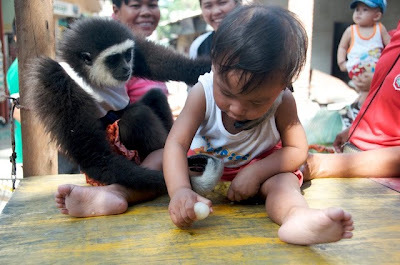 The monkey continued to pull the kid’s ears and manhandle him while his mother and her friends laughed. Just another day on the island, I suppose. Kho Phi Phi made it into the news in 2004 for being especially hard hit by the tsunami on the day after Christmas. As you can see in the picture of the viewpoint, the main town of the island is situated right on that low-lying isthmus. After this tragedy, an array of early-warning devices have been installed on and around the island to alert the inhabitants to future tsunamis. Travel for Teens will visit Kho Phi Phi this summer on our Thailand Service & Adventure program. We’ll soak up the sun, go diving and snorkeling, go hiking, and soak up the unique island culture on this tropical paradise.